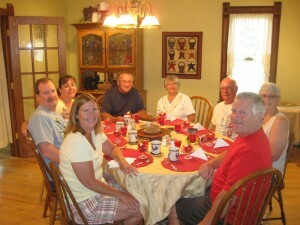 Our canoeing and kayaking guests, (left to right) Cindy, Douglas, Tish, Dave, Gene, Richard, Sue, and Pat. The time has never been better to canoe and kayak the beautiful Kickapoo River of southwestern Wisconsin which has been a favorite of canoeists for many years. Many of our guests have never experienced the Kickapoo River and are always excited to find out about the canoeing and kayaking that is only minutes away from Amil’s Inn Bed and Breakfast. This past weekend we were blessed with return guests for canoeing and kayaking who brought friends of theirs who had not been on the Kickapoo before. The Kickapoo River is the Wisconsin River’s longest tributary. The Kickapoo River meanders for about 130 miles from Wilton to Wauzeka, where it empties into the Wisconsin River. “As the crow flies”, this distance is about 60 miles. The word “Kickapoo” is from the Native American Algonquian language meaning “he who goes here, then there” which very accurately describes the Kickapoo River, which flows in all directions of the compass for portions of its length. The Kickapoo River’s shallow, gently flowing is tame enough for the beginner canoeist but scenic enough for the advanced peddler. The upper stretch of the River between Ontario and LaFarge is the most beautiful and the most accessible for the public to enjoy. The river will take you through the Wildcat Mountain State Park and the Kickapoo Valley Reserve. Along the way you will see many forms of wildlife. There are over 100 species of breeding birds that call the upper Kickapoo home. You will also encounter muskrats, beaver, white-tailed deer, raccoons, woodchucks, mink and otters. The best wildlife viewing opportunities are early morning and on weekdays when canoe and kayak traffic is the lightest. For plant lovers you will also encounter over 300 species of plants that provide a constant display of color from early spring through late fall. For those who don’t have their own canoes or kayak’s, Ontario has several canoe rental businesses. Visit www.amilsinn.com and check out the “Area” tab to find a complete listing with contact information. Special Thank You to the Wisconsin DNR and Kickapoo Valley Reserve websites for information used for this blog. Please visit http://dnr.wi.gov/topic/parks/name/wildcat/todo.html and http://kvr.state.wi.us/category.asp?linkcatid=1971&linkid=949&locid=115 for more information on canoeing and the Kickapoo River.